I am new to GNine and Gn15 and want to build a small micro layout starting with GNine. As much as I would like to buy a Sidelines Titch for my Bachmann N scale Plymouth mechanism, the budget for our current home bathroom remodel says I can't. Therefore, does anyone have any drawings for a small industrial type GNine locomotive I can build from either cardboard or styrene to fir the Bachmann mechanism? My cars will be scratch built bodies over Bachmann N scale 40 foot underframes to represent a bogie wagon that Ian Holmes built. Anyone know what size deck boards and what size planking I should use for a single plank or two plank gondola? Thank you. Denny D.
Lacking anyone offering drawings, you might consider scratchbuilding your own design roughly following 7.5" designs. I would suggest starting with a deck plate the same length as the loco and about 27mm wide (3X track gauge) with a cutout for the Bachmann components that stick up above deck level, and then build on a tall motor housing over the original cab area, and a seat over the original engine hood area. On the pepper7 website Steve posts the dimensions of most of his offerings. That could get you started using plastic (styrene) sheets from the hobby shop. Some really fine work has been done with plain cereal box cardboard. Check out the loco area on this website. Here is a plan from the Loco Shed drawn by one of our members. It is GN15 but could be narrowed a few millimeters to be a fine G9 Deutz. With regard to deck planks, my cars following the instructions on the Gnine.info site had 5/32" wide planks, 5" wide in 1:32n1. Those would be about 3-1/2" in G scale. Most important is to select a width that gives an even number of boards for the length of the car; I tweaked the width a bit to fit, so the width varies a little from plank to plank. 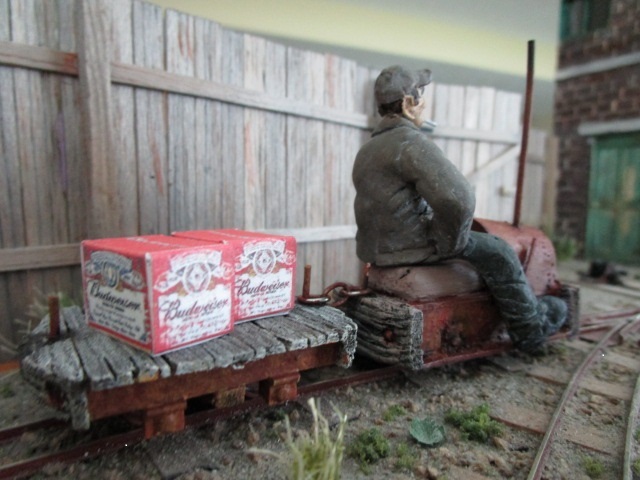 Start I made some years ago on a 1:72n2 loco using a Bachmann Plymouth. Deck plate is probably a little narrower than one would want for G9 (and was cut a bit oversize in length), but shows how the hood/bonnet section is low enough to easily fit a seat over it, while the cab section can be hidden under the G9 hood/bonnet. 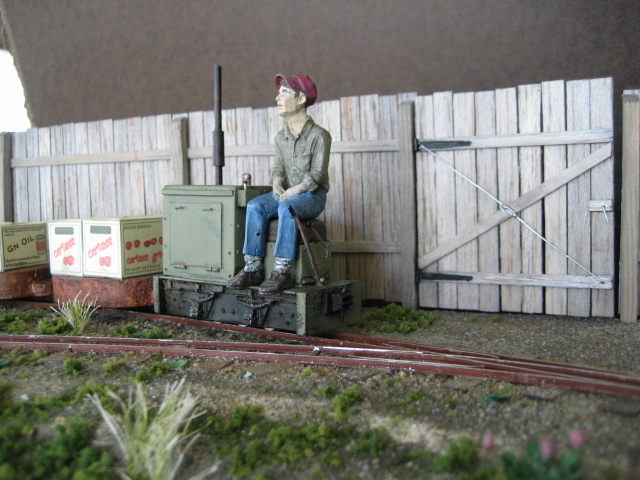 Engineer is from a 1:24n16" loco, so would need to be posed with his feet closer in for a 7.5" gauge loco. Thank Jeff for the great inspiration. Do you remember what sizes of styrene you used for the critter frame? Also how wide did you build the flat car? The Bachmann Plymouth mechanism is a good choice. I have built several critters using it as power. I generally use cardstock. I have posted a few threads on critters. Three are Gnine using this mechanism. You may find them helpful. Nothing original about my designs as I copied most from others like Sidelines. That is a wonderful radio installation, Bob. Is the trailing care self propelled? I can't quite tell if it has a motor, or if the motor is in the Speeder in front? No. 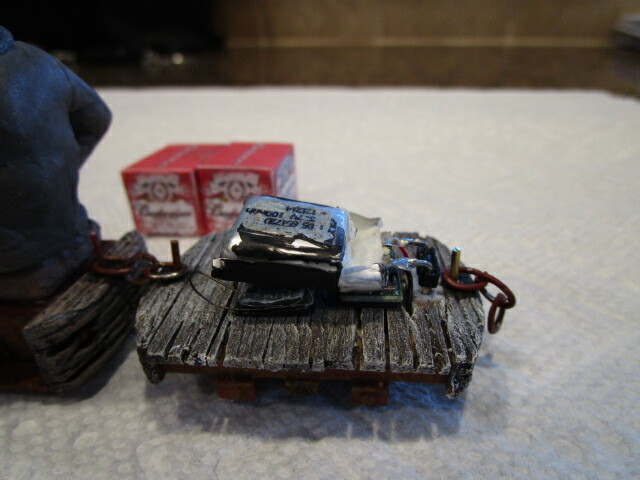 The critter has a Bachmann Plymouth mechanism. The trailing car has a DelTang unit, Pololu voltage booster and single cell lipo battery. Flatcar bodies are 1" wide. Critter underframe appears to be 0.060" thick styrene, although I think 0.040" should be stiff enough for such a small model. Likely that I had a piece of 0.060" scrap just about the right size, and strips to make the side frames.